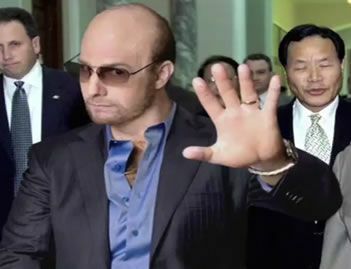 In a funny press release put out by Paramount Pictures and MTV Films, it was officially announced that a biopic all about the fictional super-producer Mr. Les Grossman was being developed by the studios. Michael Bacall (Scott Pilgrim vs. The World) has been tapped to write the screenplay, and Tropic Thunder director Ben Stiller and Stuart Cornfeld of Red Hour Films will be producing. What’s more fun than a well-placed cameo? Those brief appearances by a well-known actor or character that has relations to the title their appearing in can really brighten a movie and excite the fans who aren’t expecting them. In honor of the cameo, I’ve decided to compile a list of cameos that just flat have entertained me over the years. Keep in mind, these aren’t necessarily the best cameos ever done; I know there’s some crazy good ones like the Stooges in It’s a Mad Mad Mad Mad World and so on. No, these are some of the most amusing cameos that brought a little smile to my (and surely many others) face or made people keel over laughing. Some are just classic and some are complete nostalgia, but one thing is for sure… all are a damn good time. Oh, and I don’t want to hear anything about Neil Patrick Harris from Harold & Kumar. While hilarious, he was playing himself as a full character. You can’t cameo as one of the main parts in TWO movies, even if you are playing yourself. In some cases there’s a little video included to remind yourself how good these are, so if you enjoy a good cameo like we do, please continue reading to check out 9 of the Most Entertaining Cameos in Movie History! Have you ever watched a movie that your conscious mind continually told you that you shouldn’t be enjoying? That the premise was thin, the majority of the acting was way overblown, and that teetered it on the edge of “Scary Movie 15” lameness, yet somehow you found yourself laughing and having a good time? 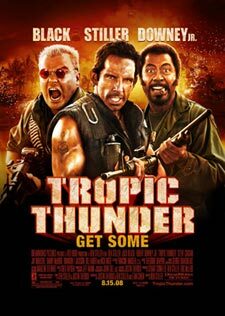 That is exactly the movie that Tropic Thunder is to me. In order to discuss my thoughts on this film, I’m going to have to delve into some character details that may be considered spoiler territory, so be warned. Still with me? Cool. Here we go. 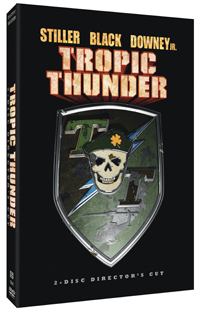 Tropic Thunder is one of those “high concept” films that tells the story of the making of a film within the film itself. 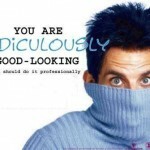 The idea is nothing new, and neither is Ben Stiller’s desire to skewer the profession he loves. It’s well worn territory. And while I’d love to say that Stiller, who wrote, directed, and stars in this film, walked this well worn territory in a fresh and interesting way — I can’t. The truth is, this film offers us very little that we haven’t seen before. 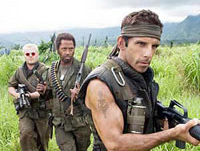 Tropic Thunder, the first full-on comedy directed by Ben Stiller since his sublime tribute to airheaded male models Zoolander, is both a love letter and a poison pen middle finger to the increasingly overblown business of moviemaking. It’s a measure of the amount of serious guts and brains that it would take a major Hollywood studio (in this case Dreamworks) to green-light an expensive action-comedy that’s also a savage satire of the industry itself. 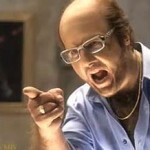 But a movie like Tropic Thunder has been a long time coming. Having your cake and eating it too has rarely been this hilarious. Damien Cockburn (Steve Coogan) is only a few days into the shooting of his directorial debut, the mega-budget Vietnam War epic Tropic Thunder based on an acclaimed memoir of the same name by veteran Sgt. John “Four Leaf” Tayback (Nick Nolte, giving great grizzle), and the production is in an unprecedented state of chaos. It’s taken over four weeks happen, but The Dark Knight has finally been toppled from its perch atop the box office rankings. Of course, its fall wasn’t too great, dropping only to number two, but its successor Tropic Thunder is surely pleased with itself right now. 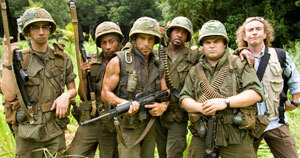 With an estimated weekend gross of $26 million, Tropic Thunder opened on top this week, probably thanks in part to Robert Downey Jr‘s involvement and subsequent press hype. The rejuvenated and forgiven actor is definitely keeping his name out there with his comments last week about The Dark Knight. Nevertheless, given all that, TDK only finished less than $10 million behind Tropic Thunder with $16.7 million, and just over a million ahead of Star Wars: The Clone Wars ($15.5 million), which has suffered poorly from bad reviews. Though, one look through my review points to a complete bewilderment on my part as to why those reviews are so harsh. This country loves its parody, doesn’t it? The National Lampoon brand made a career out of it, Saturday Night Live is in its 34th season, and late night talk shows — a staple of which is poking fun at current events — have been around for over half a century. As much as people would sometimes like to turn their nose up and scoff at the audacity of the envelope being pushed, the market has been thriving almost as long as the medium has existed. So it always baffles me when these rights activists get their draws in a bunch over something that, even in the wildest stretches of imagination, was never meant to be taken seriously. 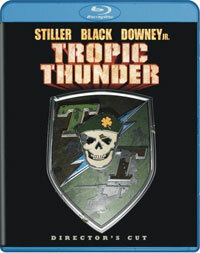 Tropic Thunder is a Hollywood movie making fun of Hollywood making movies. On the set of “the most expensive war movie ever made,” first-time director Damien Cockburn (Steve Coogan) can’t pull his lead actors from their pools of self-absorption, costs are spiraling out of control, and the studio threatens to shut down production for good. He decides that he will set the actors loose in the jungles of Southeast Asia (and into the path of some real local mercenaries) to find their way back, all while the actors think they are still filming their Vietnam movie. The story itself isn’t terribly original or complicated — it tastes almost exactly like a dish I had years ago called The Three Amigos — but the point of the movie isn’t in the premise, which only exists to drive the story, it is in the parody.